This area is south of Pluto's dark equatorial band informally named Cthulhu Regio, and southwest of the vast nitrogen ice plains informally named Sputnik Planitia. North is at the top; in the western portion of the image, a chain of bright mountains extends north into Cthulhu Regio. 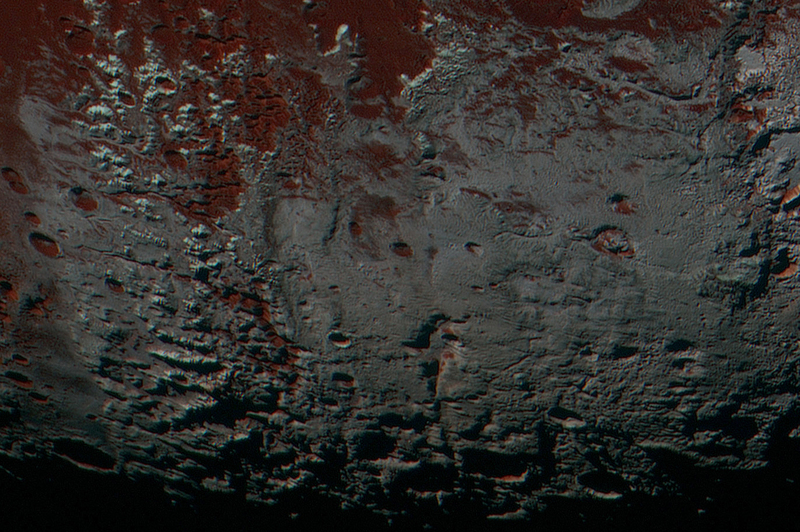 New Horizons compositional data indicate the bright snowcap material covering these mountains isn't water, but atmospheric methane that has condensed as frost onto these surfaces at high elevation. Between some mountains are sharply cut valleys – indicated by the white arrows. These valleys are each a few miles across and tens of miles long.